My friend just sent me this link, and I am SO excited to try this with my curious three-year-old! He LOVES playing with tools, too, so I am sure the hammer will be put to good use. Thanks for all the great ideas, I am trying to be more intentional with sensory play and I'm finding such inspiration on your site. We love ice...I give the kids clear blocks with warm colored water in a turkey baster...they make holes in the ice with it. A great activity. An edible version: freeze ice cube trays of colored juice, Kool-aid, etc. 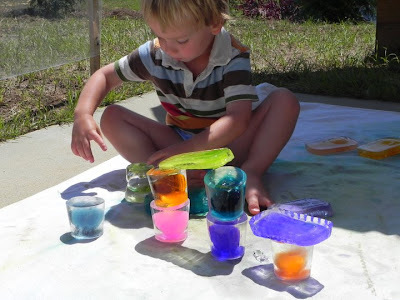 Put one color in a gallon plastic freezer bag and let the kids hammer away to turn the blocks into slush. Then they can layer the different colored slushes into a clear cup. It makes a beautiful, cool, yummy snack on a hot day. Love your blog and will be trying many of your ideas with my son. When I was a kid I used to like freezing the long balloons you use to make balloon animals (filled with water), you can position them in different shapes in the freezer, then remove the balloon once they are frozen. Great fun on a warm day.